Bariatric surgery has become the gold standard for the treatment of morbid obesity. Post-operative changes in gastrointestinal hormone levels have been implicated with weight loss as well as remission of diabetes mellitus. However, it is unknown if these beneficial changes are secondary to weight loss or to the mechanical alteration of the anatomy of the proximal gastrointestinal tract. We reviewed all studiesperformed to date within our institution evaluating post-operative gastrointestinal hormone levels. Radioimmunoassay and ELISA was used to measure levels of ghrelin, leptin, amylin, glucagon like peptide-1 (GLP-1), gastric inhibitory peptide (GIP), and peptide YY3-36 (PYY). Fasting and post-oral glucose pre- and post-operative hormonal levels were compared in patients undergoing laparoscopic roux-en-y gastric bypass (LRYGB). Additionally, these patients were matched for age and body mass index to patients undergoing laparoscopic gastric banding (LGB) and to patients achieving weight loss by hypocaloric diet alone. 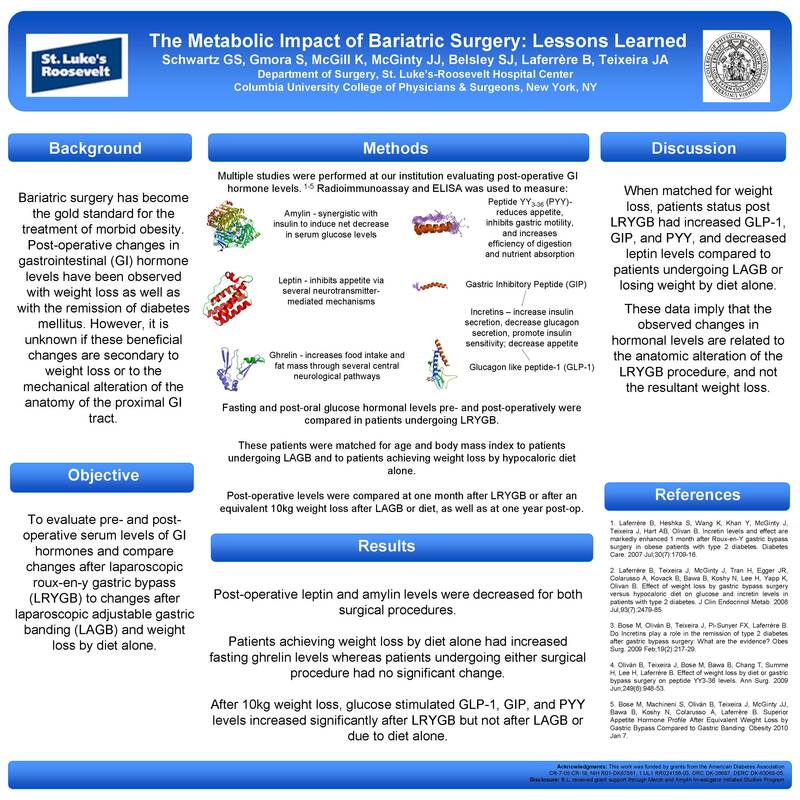 Post-operative levels were obtained at one month after LRYGB or after an equivalent 10kg weight loss after diet or LGB, and one year post-operatively. After 10kg weight loss, glucose stimulated GLP-1, GIP, and PYY levels increased significantly after LRYGB but not after LGB or due to diet alone. Patients achieving weight loss by diet alone had increased fasting ghrelin levels whereas patients undergoing either surgical procedure had no significant change. Leptin and amylin levels were decreased for both surgical procedures. When matched for weight loss, patients status post LRYGB had increased PYY and GLP-1 and decreased leptin levels compared to patients undergoing LGB or losing weight by diet alone. This preliminary data may imply that the observed changes in hormonal levels are related to the anatomic alteration of the LRYGB procedure, and not the resultant weight loss.